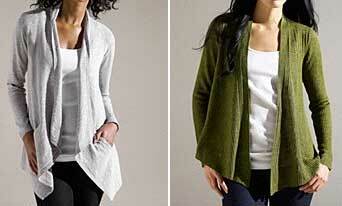 Eileen Fisher’s jackets are current classics, so we can wear them for several years. But each season she picks out one style to emphasise. And this season it has a shawl collar. 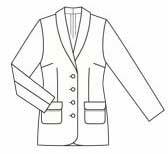 Style details : long lapels down to a single button, and lapels about 1/3 the width of the shoulders. The turn of the collar is softly rolled, not pressed flat. Cut away fronts below the button. Slightly angled welt pockets. 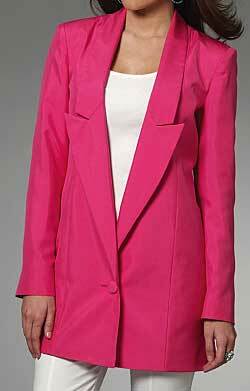 But otherwise this looks an easy fit classic boxy blazer shape. I’ve found surprisingly few classic jacket patterns with shawl collars. 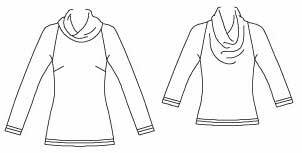 Most shawl collar patterns are for outerwear with wide picture collars. Shawl collars are cut differently from most jackets, the collar is cut in one with the front. There’s an explanation of the difference between shawl and notched collars in Threads magazine. Here’s the characteristic corner joining body and collar, from Vogue 8605 (which happens to be the only current pattern with a full shawl collar that I’ve got !). The corner needs to be stay stitched and clipped, so one side of the angle makes the front shoulder seam, and the other side goes along the back neck. Not a trick for sewing beginners (see later). And for pattern making, it’s not a trivial enterprise to add one of these to the neckline of a favourite jacket pattern. 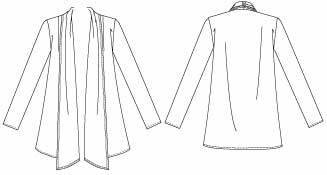 Here’s an on-line lesson on how to draft the shawl collar. If you really need convincing that drafting a shawl collar is no simple process, here’s a YouTube video on how to draft a shawl collar pattern using OptiTex CAD software ! It’s a bit difficult to tell from a design drawing how an integral shawl collar is cut. There are two ways of doing it. One has both the upper and under collars cut on. 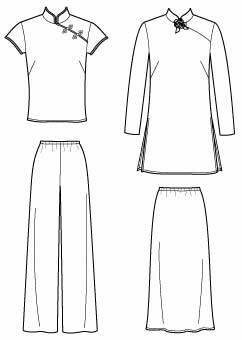 So there’s a front-under collar pattern piece (see previous diagram) and facing-upper collar pattern piece. The front-under collar in one piece makes the under collar look neat and tidy, if you want to turn the collar up. Good for outerwear, but less needed on an indoor jacket. Both the sewing videos (see later) are about that type of collar. The other approach is to cut the front and under collar separately, and the front facing with the collar cut on. Palmer-Pletsch oop McCall’s 4598 is an example. 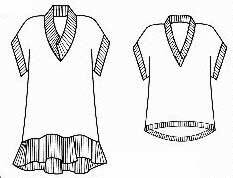 Here are the front and under collar pattern shapes (left), with the front facing for a notched collar (centre) and a shawl collar (right). It helps to be able to look at the pattern to see how the collar is cut. But if that isn’t possible, one clue that patterns must have a separate notchless collar, rather than an integral shawl collar, is if there’s a curved neckline. So the neckline can’t be on a fold, and upper and under collar must be added pieces. 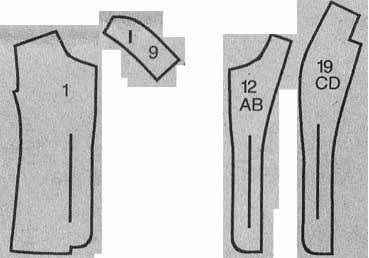 This happens in many current jacket patterns, which have an open soft curved V neckline and a ‘picture’ collar. Such as Butterick 5570. And here’s another reason to make a separate collar. 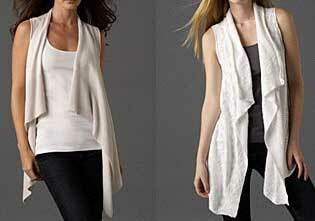 One Eileen Fisher jacket uses a different fabric for the collar. Difficult to see in black, but the collar is layers of transparent fabric. So of course that has to be cut separately. And patterns with the collar/ lapel cut separately are much easier to change the neckline shape and depth if you want to. Nancy Zieman’s McCall’s 6293 could be a starting point. I haven’t found any good on-line written tutorials for sewing that tricky corner on shawl collars. There are a couple of YouTube training videos for industrial sewing machinists. The videos use different methods for sewing front-plus-collar to back. In this first one, you start stitching from centre back, and back neck and shoulder seam are sewn in one continuous step. Two machining steps. This is also the method used in the book ‘Professional Sewing Techniques for Designers’. In this second one, shoulder seams are sewn first, then across the back neck. Three machining steps. This demo includes adding the facing. Much of the commentary is not in English, but if you’re not a beginner sewer it’s not too difficult to understand what is going on. There are several other methods. Some people avoid getting kinks in the fabric by hand sewing the corner. I prefer to machine sew each corner in 2 separate steps, starting from the corner each time. Four machining steps, so not used in industry ! Make samples and see which technique you like. What about the details of these shawl collar jackets. Single button. Try out the best height for you. Should it be where your body bends, higher, or lower ? I’m short waisted so look best with a single button below waist level. With my high round back and forward neck, I always have to change necklines and collars to get a good fit. I would need to check there’s no gapping on that long V-neck. What about the soft roll of the colar. Is this right for you, or is a firmly pressed flat collar more to your personal style ? Which would give the best emphasis to your body shape ? And notice how the fronts are cut away from the centre line below the button. This adds vertical lines below the waist, even when the jacket is buttoned. Flattering for some of us. Also means that, when buttoned, the edges of the front opening make an X shape (look at the photos) rather than a Y. Which shape might be more flattering on you ? Try out how much (if any) cut away of the lower fronts would be good. Perhaps by folding existing jacket fronts away at the front edge to see what looks best. And the placing and angle of the pocket welts ? On me, emphasis at high hip level is best avoided, so I would make these nearer vertical. So, if I made one of these jackets, there are several good reasons to start with a test muslin to try out the details. Some stylists say a shawl collar looks matronly. Others think it’s flattering as it frames your face and adds vertical lengthening lines. I certainly think they can look good if you get the details right for your own body shape and style. The easiest way of getting the long lines of a notchless collar look, though not the same effect as an integral shawl collar, is simply to add a neckband wide enough to fold over. There are several patterns for this, such as Christine Jonson’s 511 Boyfriend jacket (left), or the Shawl jacket from Loes Hinse (right). Classic notched collar blazers are the main fashion jacket this season. 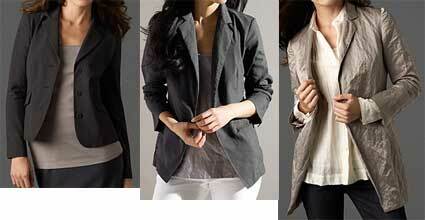 And there are several in the group of jackets picked out by Eileen Fisher, see next post. Plus some other jacket styles. More jacket posts planned ! Oriental styles are fashionably ‘ethnic’ this season (2011). My previous post was on the Japanese kimono, rather a long post as it’s a popular shape. 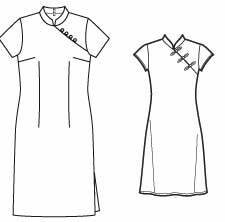 The second trendy oriental shape is the Chinese cheongsam (qi pao), which I’ve found less about. The cheongsam is a western influenced version of traditional Chinese dress, a sheath dress with mandarin collar and side angled neck opening. 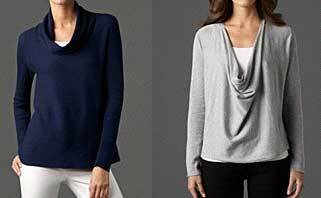 Many different style details in the designs here : whether the opening goes into or below the armhole, the darting, whether and where there’s a zip, and the sleeves. Here’s a new (winter 2016) pattern for a vintage style cheongsam : Simplicity 8244. 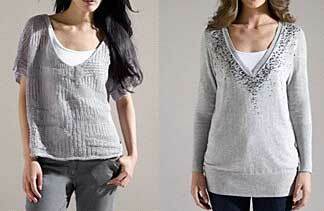 It has short cut-on sleeves, opening to below armhole, vertical waist darts only, and side seam zipper. New Look 6203 is a pattern for a top (no zip) with skirt and pants. Now available only as a download pattern, here. 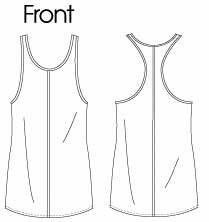 The Great British Sewing Bee book – From Stitch to Style includes a pattern for sleeveless qi pao inspired top, with opening to below armhole, angled darts, and side seam zip. 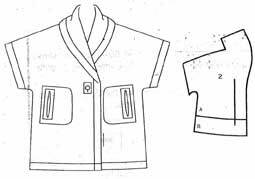 Folkwear has patterns for a cheongsam, Folkwear 122 (left) (no zip) and for a jacket with similar side opening Folkwear 114 (right). Not many patterns available, compared to the riches for the kimono. 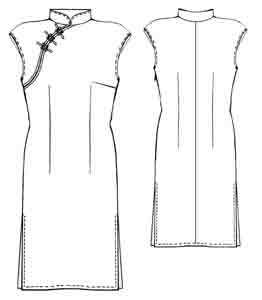 There is a free download sleeveless cheongsam pattern here (side seam zip). Swap the right and left front pattern pieces to get the opening towards the left side, as in the other patterns. The cheongsam is not a wrap style. Here’s a Chinese diagram of the pattern piece shapes. 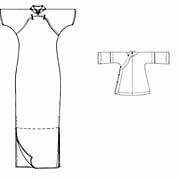 Could you use that as a guide to adapting your favourite sheath dress pattern ? Notice the Chinese diagram of the pattern pieces has the opening to below the armhole, and angled darts (‘french’ darts up from below bust level). Some of the other patterns have the opening into the armhole, and horizontal bust darts. I suspect the free pattern, with opening to below armhole and no dart that side, may be difficult to get to lay neatly against the body. For a beautiful book, there’s Cheongsam by Pepin van Roojen, which includes a CD of dress and fabric images. Japanese company Clover has templates so it’s relatively easy to make the traditional Asian Knot buttons from cord or bias rouleaux. Patterns and links revised October 2016.